The Global Fourth Way: The Quest for Educational Excellence: Deep and lasting educational reform doesn’t happen overnight, even in this fast and flexible 21st century. This example-packed sequel to The Fourth Way draws upon inspiring examples unearthed by brand new research to challenge educational leaders, teachers, and policy makers to put proven strategies to work promoting student learning and achievement and the high quality teaching that drives it. Ahora, con la cuarta vía, Andy Hargreaves y Dennis Shirley ofrecen una nueva y estimulante visión de un proyecto que propone notables reformas en el aprendizaje del estudiante y en sus logros. 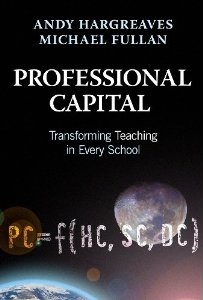 Professional Capital: transforming teaching in every school: Endorsed by NEA, AFT, AASA in the US and by NCSL and NAHT in the UK, the book takes apart the tired old stereotypes that are used to attack the teaching profession, and sets out a vision for the future of the teaching profession where we get a high return from teachers and teaching by investing in, accumulating and circulating the professional capital of the teaching profession. A Festschrift for Andy Hargreaves: 11 papers by leading and emerging scholars celebrating and concentrating on the life work of Andy Hargreaves. Three times Andy Hargreaves. Drawing on education leadership and sustainability. Thee times Andy Hargreaves is a compilation of writings from Andy Hargreaves, currently a professor at the Lynch School of Education at Boston College. The collection includes articles on education in the knowledge society, sustainable educational change and sustainable leadership. At first glance, it builds upon the work of several Dutch authors, but the special thing about Hargreaves is his integrated approach. Hargreaves convincingly explains what we can and must do in order to counter the negative effects of a stagnating world economy. Sustainability in this sense not only refers to change in the long term, but to a substantial set of reforms that are significant in the present and in the future. Hargreaves stresses an inspiring and inclusive educational and social vision, including both educational institutions and other public bodies. He also provides an explanation of how educational professionals should be able to talk with each other and with policymakers, journalists, curriculum developers, parents and school boards and students. The two volumes of the second edition of the International Handbook of Educational Change comprise a totally new, and updated collection of the most critical and cutting-edge ideas in educational change.Written by the most influential thinkers in the field, these volumes cover educational change at both the theoretical and practical levels. The updated handbook remains connected to the classical concerns of the field, such as educational innovation, reform, and change management, and also offers new insights into educational change that have been brought about by social change and shifting contexts of educational reform. Like the first best selling Handbook, this one will also undoubtedly become an essential resource for people involved in all spheres of education, from classroom teachers, teacher leaders and administrators to educational researchers, curriculum developers, and university professors. No other work provides such a wide-ranging and comprehensive examination of the field of educational change. The Fourth Way—a revolutionary approach for transforming educational policy, processes, and practice! - In The Fourth Way, Andy Hargreaves and Dennis Shirley offer a vision and a plan that integrates government policy, professional involvement, and community engagement to help transform teaching and learning in schools around the world. It is this new Fourth Way of change, say the authors, that will enable governments and educators to create a more inclusive, inspiring, and sustainable future without relinquishing those educational elements that support the development of personal integrity, social democracy, and the advancement of human decency. Leading thinkers from around the globe set out their theories-in-action on how to achieve deep and lasting change. 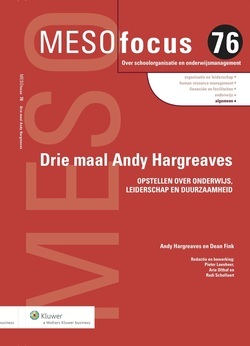 In Sustainable Leadership, Andy Hargreaves and Dean Fink address one of the most important and often neglected aspects of leadership sustainability. The authors set out a compelling and original framework of seven principles for sustainable leadership characterized by Depth of learning and real achievement rather than superficially tested performance; Length of impact over the long haul, beyond individual leaders, through effectively manages succession; Breadth of influence, where leadership becomes a distributed responsibility; Justice in ensuring that leadership actions do no harm to and actively benefit students in other schools; Diversity that replaces standardization and alignment with diversity and cohesion; Resourcefulness that conserves and renews leaders' energy and doesn't burn them out; and Conservation that builds on the best of the past to create an even better future. We are living in a defining moment, when the world in which teachers do their work is changing profoundly. In his latest book, Hargreaves proposes that we have a one-time chance to reshape the future of teaching and schooling and that we should seize this historic opportunity. Hargreaves sets out what it means to teach in the new knowledge society-- to prepare young people for a world of creativity and flexibility and to protect them against the threats of mounting insecurity. He provides inspiring examples of schools that operate as creative and caring learning communities and shows how years of "soulless standardization" have seriously undermined similar attempts made by many non-affluent schools. Hargreaves takes us beyond the dead-ends of standardization and divisiveness to a future in which all teaching can be a high-skill, creative, life-shaping mission because "the knowledge society requires nothing less." This major commentary on the state of today's teaching profession in a knowledge-driven world is theoretically original and strategically powerful-- a practical, inspiring, and challenging guide to rethinking the work of teaching. In a complex and multi-layered world, the conventional idea of great leadership being the result of the efforts of a single individual is rapidly becoming redundant. This book takes up the challenge of finding an alternative method of leadership in educational contexts, and looks at how this can help achieve sustained improvement in schools. The authors acknowledge that there are no simple solutions to school improvement. They argue that the effective leaders of the future will be those who are able to share responsibility, build positive relationships and offer stakeholders - teachers, parents and students - an opportunity to work together to improve their schools. The book is based around four key areas of concern: the changing context of leadership, leadership and school improvement, building leadership capacity, and future direction and implications. In each section, the authors discuss current theories and issues, and put forward alternative ideas and perspectives. This important book will make valuable reading for headteachers, principles, deputies and other senior teachers, particularly those undertaking leadership qualifications and training. It will also be of interest to postgraduate students and school governors. The Sharp Edge of Educational Change conveys the realities of reform as they affect educators' practice. The collected chapters each focus on particular current reform and reveals the technical and logistical complications, social and political dynamics, cognitive disjunctures and limitations and emotional demands of reform. In so doing, they provide new and rich conceptual perspectives on the contemporary nature of teachers' and administrators' work in classrooms, schools and other educational settings. For many years, education reform has been imposed on teachers in many parts of the world. Overload, burnout, demoralization, poor implementation and a rush for early retirement has been the result. This text discusses the need for positive educational change, with teachers in the vanguard of it, rather than making them its marginalized victims. The authors interpretation of positive educational change means strong emphases on professional development, ensuring that every school and department becomes a strong professional community; valuing, not vilifying educational research; putting teachers in charge of standards and change; giving schools more flexibility over curriculum and assessment, not less; and regarding our educational past as something to be built upon, not castigated and forgotten. The writers identify new doctrines for implentation in England, Australia, North America and Japan. Open University Press - Limited Availability. This final book in the invaluable Whatís Worth Fighting For? trilogy concludes that the relationship between those in the school and those outside it must be fundamentally reframed. In a world of growing complexity and rapid change, if educators are going to bring about significant improvements in teaching and learning within schools, they must forge strong, open, and interactive connections with communities beyond them. To do this, the authors urge teachers and principals to go "wider" by developing new relationships with parents, employers, universities, technology, and the broader profession. At the same time, educators must also go "deeper" into the heart of their own practice by rediscovering the passion and moral purpose that make teaching and learning exciting and effective. As in the other two books in this series, the authors provide guidelines for teachers and principals to help them expand and improve their thinking and practice, and to show policy makers and communities what they can do and why they should do it for the sake of the future of children and society. Time has long been recognized as a serious obstacle to successful	school reform. InRacing with the Clock, ten teachers write about time-related frustrations growing out of school reform efforts and how the problems were (or were not) resolved. The descriptions are rich with specific examples of what it is like to actually experience school reform and how it impacts on a teacherís already full day. The cases are preceded by contextual descriptions, and a chapter by the editors on time-related issues raised by the cases. Each case study also includes one or more commentaries prepared by representatives (e.g., principals, department chairpersons, other teachers) from schools and districts discussed. They present new or different perspectives on the issues, and identify new questions and topics for discussion within the cases. The book concludes with an insightful essay by Andy Hargreaves, who worked with the teachers in constructing their cases. The experiences and observations offered in Racing with the Clock will provoke discussion in teacher education classes and wherever experienced teachers come together to replenish their professional commitment and enthusiasm. Why does successful, enduring change beyond a few isolated schools continue to elude us? The fundamental problem, says Editor Andy Hargreaves, is that educational change is more complex and controverial than the change literature has recognized. In this book, Hargreaves and the other contributors move the dialogue about change beyond the technical aspects to three essential areas of teaching, learning, and leadership that have received only limited attention: the passion, purpose, and politics of change. Each chapter looks realistically but also optimistically at many of the complexities of change. Together, they extend the educational change agenda, confront some of the most difficult obstacles, and offer hope and practical guidance for bringing about positive educational change that benefits all students. Schooling for Change is based on extensive international research which looks at how schools in general and secondary schools in particular, have been selling our young people short. Drawing on this rich grounding of research but written in an accessible and provocative way, this book explores the possibilities for better schooling for early adolescents. It is thoughtful and thought provoking in its critique of existing school practice and is ground breaking in its review of alternative schooling practices for early adolescents. All educators who have struggled with trying to create better schooling for the future of our youth and for the youth of our future will find invaluable insights and encouragement in this important book. Teacher's professional lives - aspirations and actualities, Andy Hargreaves and Ivor Goodson; teacher's work, restructuring and postfordism - constructing the new "professionalism", Susan L. Robertson; teacher professionalism and curriculum control, Gill Helsby and Gary McCulloch; are professional teachers a good thing?, Thomas Englund; historical notes on the barriers to the professionalization of American teachers - the influence of markets and patriarchy, Andrew Gitlin and David F. Labaree; using drawings to interrogate professional identity and the popular culture of teaching, Sandra Weber and Claudia Mitchell; teacher professionalism in local school contexts, Joan E. Talbert and Milbrey W. McLaughlin; student teacher's lay theories - implications for professional development, Ciaran Sugrue; women as teachers - teachers as women, Miriam Ben-Peretz; knowledge, teacher development and change, Marvin F. Wideen et al; development and disenchantment in the professional lives of headteachers, Christopher Day and Aysen Bakioglu. In addition to its outstanding analysis of "total teachers" and school culture, this book provides insightful action guidelines for teachers and for principals that will help school educators take responsibility for reform. In an effort to develop new mind sets, knowledge-bases, and day-to-day dispositions and actions that should characterize the education profession of the future, this book talks about how teachers can work together for positive change, how they can collaborate with others outside the classroom to improve what goes on within it, and how principals and other leaders can support their teachers to make this happen. "The rules of the world are changing. It is time for the rules of teaching and teachers' work to change with them." This is the cahllenge which Andy Hargreaves sets out in this new book on teachers' work and culture in the postmodern world. Drawing on his current research with teachers at all levels, Hargreaves shows through their own words what teaching is really like, how it is already changing, and why. He argues that the structures and cultures of teaching need to change even more if teachers are not to be trapped by guilt, pressed by time and overburdened by decisions imposed upon them. Provocative yet practical, this book is written for teachers and those who work with teachers, and for reasearchers who want to understand teaching better	in the postmodern age.